Christmas is rapidly approaching and as you know, one way we celebrate the Savior’s birthday each year at Sunlight is by collecting shoe box gifts from our church family and community and sending them out to hurting children around the world in the Name of Jesus. As we reach children with the power of the Gospel, they are becoming a generation of believers who are proclaiming Christ to their nation. Have you heard the good news in Haiti? 2011 was the first year that OCC was able to offer The Greatest Journey in Haiti. The Greatest Journey is the follow up discipleship program of OCC. Children can gather for 12 week classes with local church partners. The gathering may include sing-alongs, Bible Stories, verse memorization, and other activities. The Greatest Journey curriculum equips children to store the truth of the Gospel in their hearts. Once a child completes the 12-lesson Bible study, they receive a special New Testament in their own language, oftentimes it is the first copy of God’s Word in their household. We know that one day the toys we send them will be gone, but the Gospel does not perish, spoil, or fade. Through OCC, church partners in Haiti handed out shoe box gifts to 286,000 children. Since that last distribution, over 60,000 girls and boys have completed the 12 Bible Lessons in The Greatest Journey program and received New Testaments in the Creole language. Of those children, 27,000 children made first-time professions of faith in Christ. Sunlight doubled it’s box donations past years and many of them went to Haiti. Never underestimate the power of a your gift in the hands of an Almighty God. 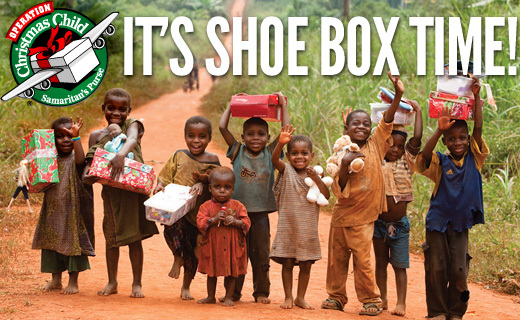 I pray you will pack a box for Operation Christmas Child this year. Boxes and booklets on how to pack a box are now available in the lobby. I thank God for all of you who pray, pack shoe boxes, volunteer your time, or give financially in support of Operation Christmas Child. May God richly bless you and your family this Thanksgiving and Christmas.